Namaaste Kitchen is the brainchild of ‘Best Chef of The Year’ award-winner Sabbir Karim. Since opening in November 2010 Namaaste Kitchen has received a multitude of critical acclaim, named as ES Magazine’s ‘Critics’ Choice’ in 2011 and voted Best Indian Restaurant 2014. 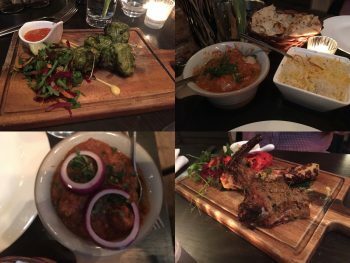 Serving a variety of North and South Indian inspired dishes, all with a contemporary twist and specialising in healthy Indian grills. Namaaste isn’t the best Indian restaurant I’ve ever been to but the food was nice and the staff friendly. The menu has all the standard dishes you would expect to see and is reasonably priced. If you live in the area and are looking for a decent take away then this is probably a more suitable option to have delivered to your door rather than going out for a meal.